In this LAB, I am going to share with us on how to configure DHCP servers for VLANs in router on a stick scenario. Three sub-interfaces will be created on the router, each representing a VLAN, with each sub-interface having a dhcp server configured to handle IP address leasing to hosts in that VLAN. Though I have treated VLAN setup before, find it here, to ensure that everyone is carried along, this LAB will include vlan creation. The objective of this Lab is to configure multiple dhcp servers for vlans on the router to service hosts in different vlans. We will start by configuring sub-interfaces with 802.1q encapsulation on the router and the assignment of IP addresses from different subnets to the sub-interfaces. Then we go over to the switch and create vlans. 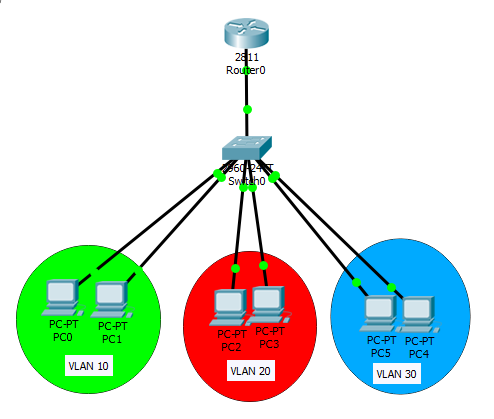 Finally, we will wrap things up with the configuration of dhcp servers for vlans on the router. Hosts in a vlan will acquire IP addresses from a dhcp server configured for that vlan. That’s it guys. At this state, all that is left is to go to the computers in various vlans and set them to acquire IP addresses automatically.